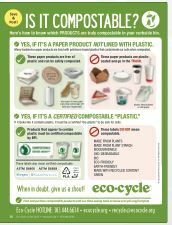 Below is our Dirty Dozen hit list of the worst recycling contaminants that must NOT go in the recycling bin. One of the challenges to single-stream recycling is the increase in contamination. 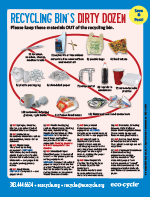 Folks tend to get a little recycling happy, tossing additional items into the bin. But, sending us non-recyclable materials jeopardizes the success of the whole program. Please help make single-stream recycling a success by keeping these materials OUT. Plastic bags are the WORST contaminant in the recycling bin. When placed in a curbside bin, they get wet and dirty and cannot be recycled. Plastic bags with a #2 or #4 can be recycled at the CHaRM if they are clean, dry and empty. 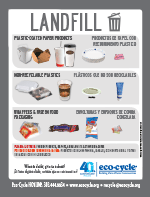 They may also be recycled at participating grocery stores; find a list of participating stores. See why plastic bags are the #1 contaminant. Send this video to your network of friends and co-workers! Subscribe to our YouTube channel! Workers have to slow the conveyor belts to rip open bags that contain recyclables and then add the bag to the heap of bags bound for the landfill. These inefficiencies waste time and money. Shredded paper is too small to sort—the pieces fall through the cracks of the sorting machines, stick to the belts and end up all over the floor. Please avoid shredding when possible because it destroys the potential for recycling. Compost shredded materials in your curbside compost bin (if you have one) or recycle them with paperboard at the Longmont or Boulder Recycling Drop-off Center. Scrap metal items of any size should not go in your curbside bin. These items cause excessive damage to the recycling equipment. 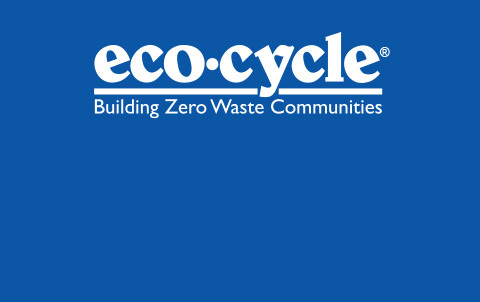 Please take these materials to the CHaRM in Boulder or the Longmont or Nederland Recycling Drop-off Center--look for the bin marked "Scrap Metal.". Hazardous waste such as paint, automotive fluids, car batteries and pesticides must be taken to the Boulder County Household Hazardous Waste Facility, not the Recycling Center. Learn more about what's considered hazardous and how to properly manage it, or call 720.564.2251 for more information. Syringes and needles, diapers and other sanitary products are not recyclable. Check out our A - Z Recycling Guide for information about handling sharps safely. The single-stream sorting equipment separates "flats" (paper) from "rounds" (containers). When containers are flattened, the equipment mistakenly sends them to the paper side of the facility, significantly contaminating the paper we're sending to market. Metal lids can be removed and recycled loose in the bin. Plastic lids and caps from glass bottles and jars should be thrown away. Paperboard boxes that were designed for freezer foods, such as frozen pizza and entrées, have a plastic polymer sprayed on them to protect against freezer burn. That same coating prevents the box from breaking up in the recycling process. 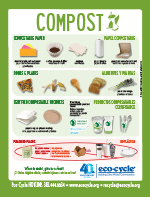 These materials are not recyclable OR compostable.